On a bright May morning, there are corners of Rathkeale that look like picture postcards or scenes from a chocolate box cover. The Wine Bar, also known as An Seabhac stands on a street corner on Church Street, just below Holy Trinity Church and close to the banks of the River Deel. It has been closed for some years now, but many remember this place as one of the most celebrated restaurants in West Limerick. ‘An Seabhac’ is the Irish for ‘The Hawk,’ and was the name given to this wine bar which became legendary for its food and its music. This detached, two-storey public house, built ca 1820, although some accounts say it may be up to 400 years old. The house was once part of a barracks and cannon portholes can still be seen in the garden walls. The house a pitched slate roof and rendered chimneystacks, rendered walls, and square-headed openings with timber sash windows. 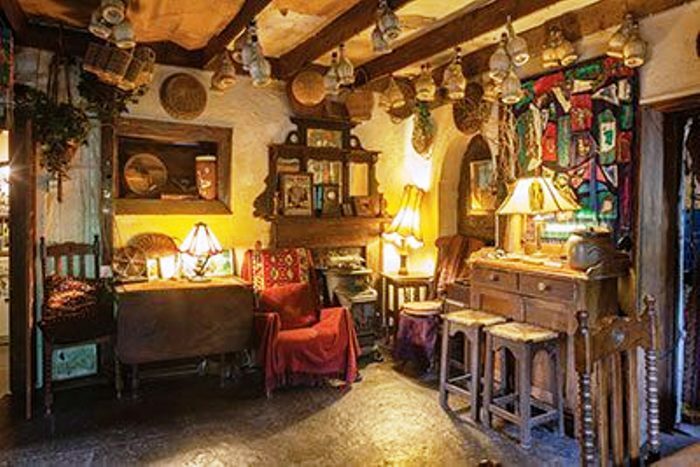 Some years ago, the house was feted in an American magazine feature by the writer Carleton Varney, who recalled that in 1903, the home became part living space for the family and part pub for people who enjoyed folk music, literature, poetry and happy times. He claimed the home of Ann and Gerald Fennell goes back some 400 years, and he told his American readers how it is filled with old, old world charm where the Fennells enjoy their garden, simplicity, and their music and art. Ann was born in Killaloe, Gerald is from Cork, and the two have travelled the world. She was a flight attendant for Ansett Airways in Australia, and also worked for De Beers diamonds, while Gerald served in the Irish Army Medical Corps. In 1945, Gerald’s grandmother, Elizabeth Fennell, gave her pub and home the name ‘An Seabhac.’ Gerald’s father, Morris, is said to have fought in the Spanish Civil War. An Seabhac is home to creative works of the Fennell family, including stained glass windows and tapestry hangings by Ann, collections of blue and white porcelain in the family heirloom pine Irish dresser, sculptures by Gerald, antique glass bottles on the bar, a collection of baskets, and paintings and lithographs by Irish artists from the 1920s to the present. The Fennells continue to live in this corner house. Gerald’s many sculptures include ‘Casualties,’ a tribute to the men killed in World War I. Ann, who loves textiles, antiques and all things beautiful, runs an antique shop in Glin. Their son, Dr Jack Fennell, has a doctorate in literature from the University of Limerick. The owners are now looking for a property with a smaller garden, and An Seabhac is for sale at ‘a reduced price’ through Scanlon Auctioneers. The house has four bedrooms, two kitchens, two sitting rooms, and a bar area. Outside there is a high walled garden with over 80 ft of road frontage. The gardens extend to about one-fifth of an acre.